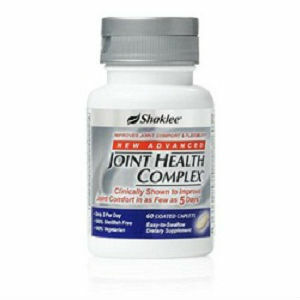 Shaklee Corporation Joint Health Complex contains no chondroitin, shown in a clinical study to inhibit glucosamine absorption. New Advanced Joint Health Complex is 100% shellfish free and a 100% vegetarian product. The product source provided limited information about product contents. Ingredients included the following: zinc, copper, manganese and vitamin C. Information about the quantities of these ingredients in the actual product was not provided in the product source. No dosage information about product dosage was provided in the product source. $44.65 is the price for a single product bottle. The number of doses in a bottle was not provided. The vendor has a product return and guarantee policy spelled out in the product refund and return page on their website. Product reviews and testimonials were also available on the product source website. Information on this product was limited. Since the product is sold both on the vendor website and from independent dealers, a prospective buyer may want to contact the vendor or a dealer directly for more information on items such as ingredients and dosage prior to purchasing. Mark Stevens	reviewed Shaklee Corporation Joint Health Complex	on September 1st	 and gave it a rating of 2.